“What Makes You Beautiful” is a number performed at prom. Heather sings “Dinosaur” by Ke$ha, with four Cheerios wearing T-Rex heads as backup. Ryan Murphy wrote the episode. Puck and Becky spike the punch bowl. Darren has ungelled, poofy hair. Chord sings “What Makes You Beautiful” (the One Direction song). Not sure if Matt sang on it too? Kurt and Blaine are at prom together, as are Finn and Rachel. Quinn is in a wheelchair. Finn yells at her to get up and walk. Sue intervenes. SO. I just got back from the set where I watched them film part of the Prom episode. Mostly it was just the announcing of Prom Queen and King. I don’t know how much of this is already known so I hope this doesn’t get back to me in some way and I’m never allowed on set again. But it’s too good to hold in. THERE IS A POSSIBLE FABERRY MOMENT. 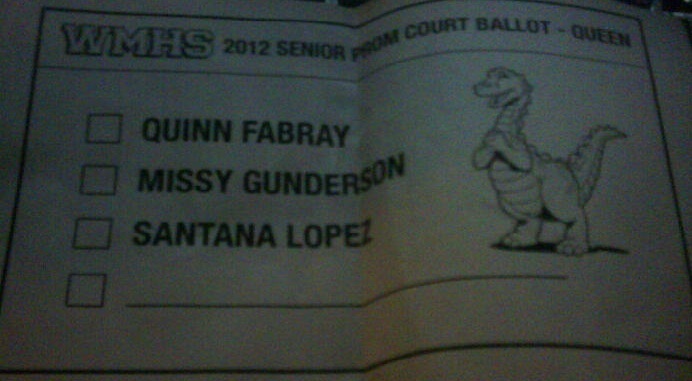 VOTE QUINN FABRAY FOR PROM QUEEN!!!!!!! After the Queen and King are announced (I won’t say because I don’t want to spoil EVERYTHING) Quinn and Santana sing “Take My Breath Away” (this is where the possible Faberry moment happens because she’s singing as Rachel is dancing so we can only hope). Also, Quinn is not permanently paralyzed.